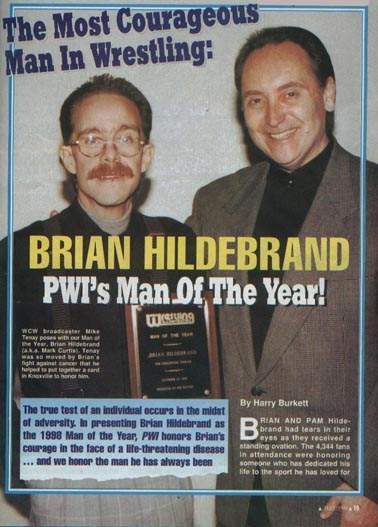 Brian Hildebrand was a referee in many organtisations, including ECW and WCW (where he was known as Mark Curtis)..
Brian Hildebrand built extremely close relationships with dozens and dozens of wrestlers over his career..
September 8, 1999: Brian Hildebrand passed away at the age of 37 from Stomach Cancer..
Mike Aldren wrote (September 8, 2009): Today marks the ten year anniversary of the death of Brian Hildebrand aka Mark Curtis who died of stomach cancer at age 37. He was best known for his run as a referee with WCW in the 90s. During his time in WCW, he earned the nickname The Shooter after a fan attempted to interfere during a live television match. As the invading fan slid under the bottom rope to enter the ring, Hildebrand, who happened to have glanced over just as the man jumped the guard rail, dropped to the mat, placed the man in a guillotine choke, and held him there until WCW security could remove him. During the final stage of his disease in 1999, a benefit was held in his hometown of Rostraver Township, PA that featured several major stars at the time including Mick Foley, Dean Malenko, Eddie Guerrero, Chris Benoit, Chris Jericho, Shane Douglas, Bruno Sammartino, Dominic DeNucci, Terry Taylor, D’Lo Brown, Al Snow, Billy Kidman, Chris Candido, and many others.